One of the next big trends for retail and shopper marketing is on display this week at the National Retail Federation’s 100th Annual Convention & Expo in New York. iSIGN Media, currently possessing the largest digital signage footprint in Canada and 3rd largest in North America, is showcasing their innovative – proximity marketing. Retailers in 2011 must communicate via mediums that consumers understand: Internet, digital displays and mobile. 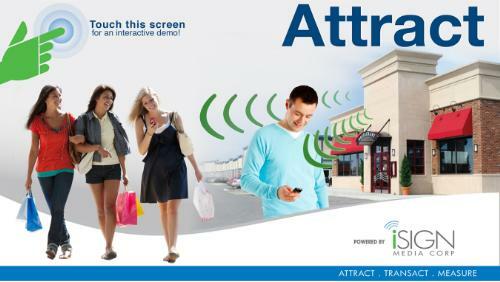 Proximity marketing’s combination of digital signage, interactive touch screens, and mobile integration allows retailers to send messages directly to consumers’ phones by automatically detecting their presence within close range (up to 300 ft) of a retail space and providing relevant and welcome content, such as coupons, promotions, videos and other rich media directly to shoppers’ mobile phones – upon their request. Instant connection: Retailers can connect with consumers as they are shopping, in-store and primed to buy. A recent study conducted by IBM found that 72% of consumers are more likely to take action after receiving a message while “on location” compared with messages received off-site. Mobile is everywhere: The average American spends nearly three hours a day on their mobile phone. Proximity marketing allows retailers to leverage the mobile channel as a way to connect with consumers in location. Here and now: Because proximity marketing is done in real-time, retailers can manage and measure their campaigns immediately, helping them improve the effectiveness of advertising campaigns in the short and the long-term. Respect for privacy: Retailers avoid privacy issues as proximity marketing uses Bluetooth™ technology and does not involve consumers’ email or phone numbers. Consumers can opt-in if they want to receive SMS or email alerts as well. You will not be charged for this message: Low cost of entry – retailers and consumers avoid any mobile carrier charges to deliver or receive marketing messages. Proximity marketing can greatly improve the customer experience by providing relevant and targeted content, unique engagement options as well as advertising and promotions before the point of sale. It allows today’s savvy and technologically-oriented consumer to engage, interact and transact how, when and where they wish to, while retailers can measure their marketing’s effectiveness at every step of the way.